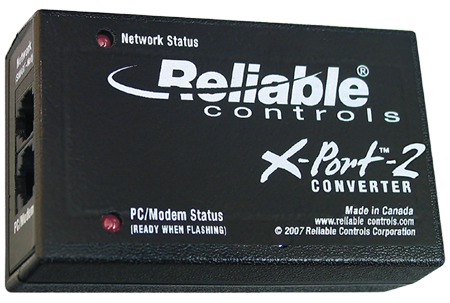 Reliable Controls is pleased to announce the release of the X-Port-2™ converter. Units are now being shipped from Reliable Controls® Headquarters in Victoria, BC, Canada. The new version supports BACnet® protocol, connection and MSet configuration for all controller types, and is firmware upgradeable for future extensions. Release versions of the Catalog Sheet are now on the web for download. The Reliable Controls X-Port-2™ converter is a convenient BACnet® communication device which provides an extra EIA-232 port to any MACH-Series controller. The X-Port-2™ converter connects to the SMART-Net™ network and transfers information between the Reliable Controls MACH-System™ and any Reliable Controls software without compromising any existing SMART-Sensors™ on the network. Power is derived from the controller’s SMART-Net port. Visual indication of operation is provided by status LEDs.